"This casserole is quick and easy. It's great by itself or with soup or salad." Preheat an oven to 350 degrees F (175 degrees C). Grease a 9x13-inch baking dish with the softened butter. Arrange the frozen pierogies into the prepared baking dish. 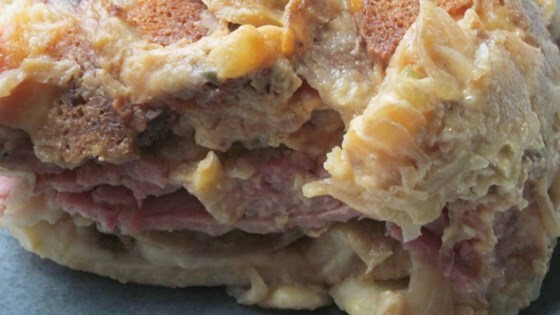 Sprinkle the sauerkraut over top, then layer with the corned beef and Swiss cheese. Spread the salad dressing over the Swiss cheese, and sprinkle evenly with the bread crumbs. Wrap the dish with aluminum foil. Bake in the preheated oven for 20 minutes. Remove the aluminum foil, and continue baking until hot and bubbly, 10 to 20 minutes more. This was so yummy! I used potato and onion peirogies and an additional cup of sauerkraut, just because we like it so much. It is a great variation on my standard pierogie dinner. This was very good. Very flavorful! Made exactly to recipe. Will make again when we get the craving for sauerkraut and corned beef. Thank you for sharing your recipe. Really great for a quick and easy meal. I made mine in a 7X11 casserole dish which worked perfectly. I also used regular bread crumb instead of rye. Very good! Just made this today and it's very good! I used potato and cheddar pierogies because that's all the store had. It did take a good 40 minutes to cook, but well worth the wait! havent tried it yet but sounds delicious!